The Sunshine State is still a wild and diverse place - 500 miles long from north to south - with four distinct seasons believe it or not, and enough nature to rival an African safari. You'll find wildlife of all kinds from the woodlands of north Florida to the sawgrass fields of the Everglades - the sheer size of this peninsula guarantees a myriad of climates and natural environments. If you've never been to central Florida, or perhaps spent your vacation at the Orlando home of one of Florida's most famous residents or diving for sponges in Tarpon Springs, you may never know you missed one of the most magical places in the state - the natural world of Citrus County. I visited Citrus County recently, an hour north of Tampa (and a world away) on Florida's west central coast. Here, one can still get a true sense for the Florida that used to be, before the Disneyfication and development of some parts of the state. It's a part of Florida where the landscape still makes sense and matches its natural environment, where the crystalline waters flow through natural warm springs a million shades of aqua green and blue. The newly restored wetlands surrounding Three Sisters Springs in Crystal River are perfect for watching and photographing birds in a natural environment. There are many unique things to do in Crystal River, Florida - and all of Citrus County - that will keep your family happily entertained for days, including several interesting State Parks: the Homosassa Springs Wildlife State Park and the Crystal River State Archeological Park. The Ellie Schiller Homosassa Springs Wildlife State Park in Homosassa Springs sits right along the busy Suncoast Highway. The State Park Visitor Center has plenty of parking and handicapped accessibility. Head inside, chat with their friendly volunteers, and wait for the next pontoon boat to take you - rather, glide you to the Park's entrance down Pepper Creek about a half-mile away. It's a lovely way to start your visit. The pontoon guides are knowledgable, and pointed out some amazing wildlife along the ride. The Park has an interesting underwater observatory where you'll see manatees up close and most likely chewing on the rope lines above! You'll also meet Lucifer the Hippo, the Park's 53-year old unofficial mascot. Known as "Lu" to his friends, he is one the Park's earliest and most-beloved residents. The Park features native Florida species, other than Lu, including many bird species, bobcat, manatees, and alligators. Allow yourself several hours to make the rounds and see all the wildlife the Park has to offer. What remains of Florida's Native American culture can be seen just up the road at the Crystal River State Archeological Park. To give the site historic significance and perspective, tour the well-appointed museum first at the Park entrance. Here you'll find descriptions of the site and well-preserved artifacts. The 61-acre site is well-maintained, provides an interesting view into early native life along this area of the Gulf Coast, and features stelae, burial mounds, middens, and a paved walkway throughout. Be sure to climb the stairs to the top of Temple Mound "H" for a scenic view of the site. You can even enjoy a picnic in the area near the waters edge. The Visitor Center right off the parking lot sets the stage with a topographic overview of the site and good information from volunteers. A modest parking fee is requested to help support the park and continue preservation. Without a doubt, the main reason visitors flock to Crystal River in Citrus County is to glimpse the West Indian manatees, those gentle giants that inhabit the waters all around this part of Florida. Three Sisters Springs is easily the best place to see manatees in Florida, and visitors can even float in the water alongside them on an eco tour. Three Sisters Springs lies tucked away in the middle of the residential town of Crystal River and offers these lovable creatures a warm safe refuge during the winter months when temperatures in the Gulf of Mexico turn cold. The boardwalk surrounding Three Sisters Springs is the perfect spot for viewing wildlife and the manatees in winter, and the wetlands expansion has not only restored the natural habitat, it's made for a more enjoyable visitor experience. The Springs and wetlands are easily reached by the Three Sisters Springs Trolley, which runs every 30-40 minutes from the Citrus County Welcome Center. Three Sisters Springs is open for tours daily from 9:00 AM to 4:00 PM from November 15th until March 31st. An all-day entrance pass offers unlimited trolley rides between Three Sisters Springs Wildlife Refuge and historic downtown Crystal River. Kayaking and stand-up paddleboarding through the cool clear spring fed waters of Citrus County is a treat for the senses. Depending on the time of year, there are always birds, fish, and manatees to see. Just remember that manatees are an endangered species. They always have the right-of-way and there is no kayaking or paddleboarding in Three Sisters Springs during Manatee Season (November 15 - April 1). Manatees are the main reason visitors flock to Crystal River, Florida and a swim with manatees is usually first on their list. One of the manatees' favorite winter haunts is Three Sisters Springs in the middle of Crystal River. The natural underground springs throughout this area of Florida provide manatees with a warm - and constant - 72 degrees, and the Three Sisters Springs draws them in by the hundreds most days during the winter months. While they call themselves The City of Crystal River, the area around the Springs is less an urban hub than it is a little oasis in the center of town. Here in Crystal River, visitors can get in the water with these adorable sea creatures, making it one of the most unique experiences you can have here. If you want to swim with manatees, Florida - and specifically Citrus County - is the only place where you can passively observe them "up close and natural" - in the water! Though the experience may be controversial among those who are rightfully concerned for the animals' welfare, we found it to be not only responsibly done but also one of the most amazing experiences we've had. Crystal River manatee tours are unique to this part of Florida, and the town has dozens of "Swim With The Manatees" tour operators who will be happy to show you around. We went out with Captains Mike and Stacy Dunn of Manatees in Paradise, and had an excellent experience! An eco-conscious couple who have been running small, educational tours since 2008, Captains Mike and Stacy practice what they preach when interacting with these gentle giants in the "true passive" manor required by the U.S. Fish and Wildlife Service. The coastline along this stretch of Florida's Gulf Coast is staggering as your GPS will illustrate if you have one - it's hard to tell where the land ends and the water begins. A spectacular sunset can be had at several on-the-water restaurants and joints in Crystal River and Homosassa, or you can head west down Fort Island Trail to the Fort Island Gulf Beach and Pier - a perfect spot with miles of rustic palm scrub and grass beds. Throw in the hundreds of wading and shore birds, and you couldn't ask for better photo ops. Though the beach and pier are great places to catch the sunset, swimming conditions here may be less than ideal if you're looking for a clear-water afternoon swim. The sand here is awash with algae and marsh beds - perfect for scalloping and kayaking around the pier - but not so much for swimming between the no-see-ums at sunset and the funky feeling of the foamy marsh between your toes. 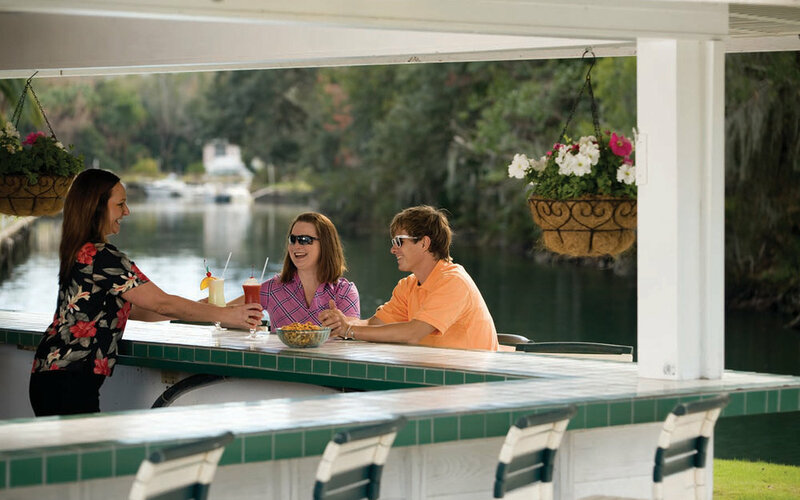 For a laid-back afternoon, head out to Old Homosassa for a slower pace and true Old Florida flavor. Park your car and get out and explore along the waterfront. This part of Florida is one of the most unique food destinations in the US because of the fresh seafood! Friendly restaurants and good-time bars are easy walking distance from each other, and if you look hard you just might catch a glimpse of the monkeys on Monkey Island! Shelly's Seafood and Fish Market is a great place to stop and watch the action as fishermen come and go with the catch. Stone crab season is truly a sight to behold October 15 - May 15. They offer the freshest seafood to take home, and in the summertime during Florida scallop season, you'll find plenty of shuckers to clean and prep the scallops you've gathered for dinner! Though Crystal River may occasionally grab more headlines, Citrus County has more to offer further inland in the lovely town of Inverness. Their slogan of "Small Town, Done Right" is spot-on. In the historic downtown, boutique shops, the newly renovated Valerie theater, and charming eateries all invite you in to sit for a spell and enjoy the ambiance. Elvis fans (like me) may recognize the historic courthouse in the round turned Heritage Museum from when he came to town in 1961 to Follow That Dream. One look around on a random weekday at noon shows the downtown buzzing with activity - outdoor cafes around town were full up with business lunchers, visitors, and cyclists grabbing a bite in between trail rides. Inverness’ 13-mile Tsala Apopka chain of lakes offers some of the best bass fishing found anywhere in the state, and can be enjoyed from a boat or a bike along the popular Withlacoochee State Trail. Winding its way along much of the lake chain, the Withlacoochee State Trail rewards the rider with scenic Old Florida views at every turn. Part of the nationwide Rails-to-Trails network, this 46-mile stretch of railroad track that was converted to a paved recreational trail is suitable for hiking, biking, and skating. Horseback riding is available on a separate trail along side the paved trail. The North end of the trail is located in Citrus Springs, south of Dunnellon, Florida and extends 46 miles to the south ending at the trailhead parking lot at Highway 301 in Dade City, Florida. On this peaceful lush pathway the only decision is whether to ride long or short. We embarked on the trail from Inverness and headed south, taking in the stunning Tsala Apopka lake chain, lush greenery, oak archways, and friendly cyclists along the way. This post may contain affiliate links. If you click through and make a purchase, we may earn a small commission at no extra cost to you. The Withlacoochee State Trail passes right by the entrance to Ferris Groves, with its home-grown Florida strawberries and citrus. So don't miss-out on 'fresh from the orchard' oranges and juice at the retail store just before you reach Floral City. A popular place to stay in Crystal River for families is the Plantation on Crystal River, an eco-friendly resort that makes a great base for water activities - from fishing and scalloping to of course, swimming with manatees! Check out the latest prices and more details. Kings Bay Lodge - For family-friendly and budget accommodations in Crystal River where kids can run around and have fun, Kings Bay Lodge deserves a closer look. One of the true remaining authentically retro motels left in Florida, Kings Bay Lodge is authentically retro, which pairs nicely with the Old Florida feel of Crystal River and nearby Homosassa. It's simple and clean, comfortable and homey, and ideally situated in the historic downtown just a block from quaint shops and restaurants. Best of all, its budget-friendly price tag makes it an excellent family-friendly lodging value. Crystal Blue Lagoon B&B - If you're wondering where to stay in Crystal River, FL or looking for hotels near Three Sisters Springs, it's hard to beat the Crystal Blue Lagoon Bed & Breakfast for it's unique personality. This spacious 4-bedroom, 4-bath home sits directly on Hunter Springs Run off scenic King's Bay. While it has a secluded feel, it's walking distance from some great shops and restaurants in Crystal River. We loved all the quirky and fun original artwork and decor inside the house and outdoors as well. Everywhere you look is a feast for the eyes with lagoon- and mermaid-themed artwork throughout. It was a perfect compliment to the natural setting outside, and if you can imagine, was even prettier at night. Crystal River State Archeological Park - 3400 N Museum Point, Crystal River, FL. Crystal River Kayak Company - 1422 SE Hwy 19, Building B, Crystal River FL Kayak rentals and guided kayak tours and canoe trips. Located a very short paddle from Three Sisters Springs. Crystal River Watersports - 2380 NW US Hwy 19 (N Suncoast Blvd), Crystal River, FL. One of the most experienced and established tour companies in Crystal River, they offer small group eco manatee tours, dive trips, scuba certifications, and sunset cruises along Florida's Nature Coast. Manatees in Paradise - 1223 N. Circle Drive, Crystal River, FL. Educational and scenic small group manatee tours with Captains Mike and Stacy Dunn. Tours depart from Plantation Adventure Center, 9301 W. Fort Island Trail in Crystal River. Inverness Bicycle & Fitness - 130 N. Pine Ave, Inverness, FL. Owners, Sherry and Danny Bechtel. Three Sisters Springs Trolley - Operated by The City of Crystal River, trolleys run daily to Three Sisters Springs, November 15 - March 31, every 30-40 minutes. Catch it from various stops around town and the Citrus County Visitors Center, 915 N Suncoast Boulevard in Crystal River. $15 (Adults), $5.00 (Child). We were a guests of Visit Citrus County during our stay, and we thank them for introducing us to this amazing part of Florida. All opinions are entirely our own based on firsthand experience - and you know we love to share what's on our mind! City of Inverness - Check out their website for the latest on what's happening around town.